Is My Jewelry Real or Fake? A Guide To Interpreting Stamps and Markings. Many of our customers ask us how we can tell if something is gold before we do any chemical tests. Well, a lot of it is just by experience but there are a few things you can look for to help determine whether your item is made from precious metals. One of the first things we look for when sorting jewelry is whether any of the items are magnetic. There are only three ferromagnetic elements which are iron, nickel, and cobalt. If an item is magnetic it is because it consists primarily of one of those three elements which more often than not is iron. So the easiest way to sort through a lot of jewelry is to use a very strong (rare earth)magnet to weed out all the magnetic items. We use magnets out of old hard drives. Even if the item is slightly magnetic it most likely does not contain any precious metals. There are exceptions to this rule; if the item is clearly marked but is still magnetic, have an expert help you determine if it is real. Once we have removed all the magnetic items from the pile we then look for stamps and markings on the items. Nearly all precious metal jewelry has a mark of some kind. On chains the marking is usually on the clasp or right next to the clasp and on rings the markings are on the inside of the ring. Often times, people find the stamp but don't know what the stamps mean. We will go through each precious metal and list the most common stamps for different grades of gold. I am sure we will miss a few but this should help you get a better understanding of what it all means. Remember, just because it is old does not mean it is a precious metal. Many stamps are simple to read and understand like: 10K, 14K, 18K and so on but sometimes there are just 3 numbers marked instead of a karat grade. The three numbers you might see are actually just a decimal number representation of the karat grade of the item. Since 24 karat is the most pure (24 parts out of 24 parts are gold) we can then figure out the percentage of gold in the other karat grades. So now we know a 10 karat piece is 10/24ths gold. 10 divided by 24 is 0.417 or 41.7% gold. This percentage is often times marked as three numbers on a 10K gold ring, 417. The same is true for all other karat grades. Sometimes the karat stamp will be followed by other letters such as P, GP, HGE, RGP, and GF. 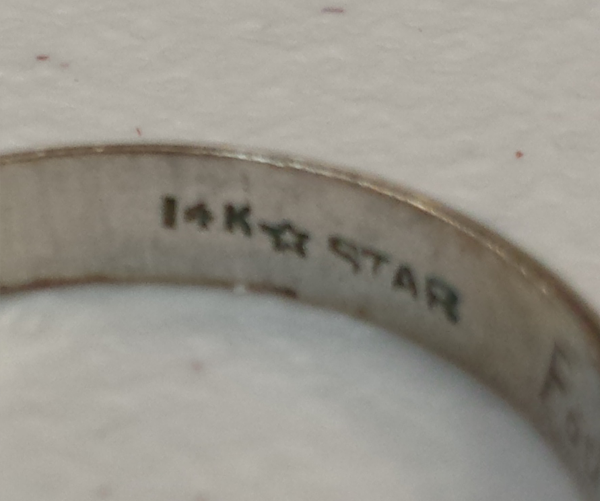 P after the stamp like "14KP" means 14 Karat plumb. The reason this is marked this way is to tell you that there is exactly 58.5% gold in the item. Not all 14 karat pieces are plumb 14 karat. As long as the item is higher than 13 karat or 54.2% gold the jeweler can legally mark the item 14 karat. GP after the stamp stands for gold plated, "18K GP" means the item is electroplated with 18 karat gold. HGE stands for "High Grade Electroplate," "18K HGE" meand the item is electroplated with 18 karat gold. RGP means "Rolled Gold Plate" Often seen as "10K RGP" or "1/30 10K RGP"This term is usually stamped on watches and is basically a very thin layer of gold bonded to a base metal. This type of piece has more gold than an electroplated piece has but it is still not solid gold. GF stands for gold filled. 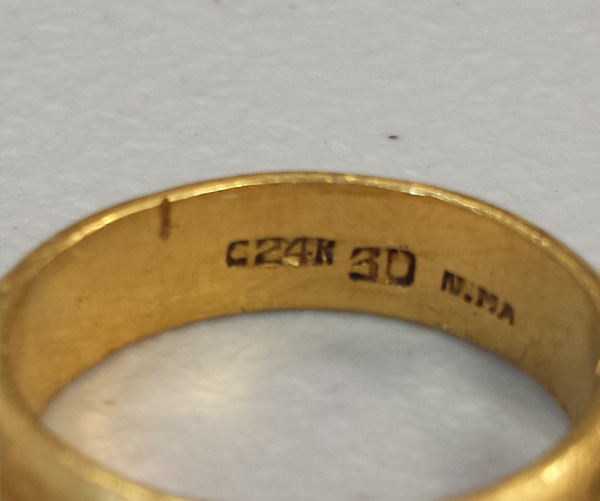 It can be marked as "10K GF" "1/20 10K GF" Sometimes the piece is not marked with GF after the stamp but only "1/10 14K" this also means gold filled. Gold filled items are similar to RGP items in that the gold is in a thin layer bonded to the surface of a base metal. The fraction before the karat grade refers to how much gold is actually in the item. "1/20 10K GF" means 1/20th or 5% of the weight is 10 karat gold. If you see a marking of 12K on an item it is almost always gold fill. Keep in mind that just because an item is marked does not necessarily mean the item is gold. There are criminals in this world that falsely mark gold plated and gold filled jewelry as solid gold items in order to make money. This is most common in tourist towns where people buy jewelry from street vendors. Many people think the term "Sterling Silver" means pure silver. This assumption is incorrect. Sterling silver refers to the purity of the silver. Sterling silver is 92.5% silver and 7.5% copper. The alloying of a small amount of copper with the silver makes the sterling silver tarnish a little more slowly and makes the metal harder and more durable than pure silver. For the most part, silver stamps are very simple and straight forward. Much like with gold, silver will be marked with a three number stamp. 900 is less common but means 90% silver. Alloys of 90% silver are usually referred to as coin silver like the U.S. dimes, quarters, and half-dollars from 1964 and earlier. 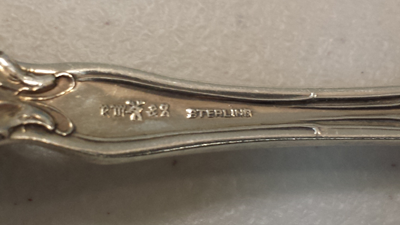 Flatware is almost always marked "Sterling" and not 925. 800 is also uncommon and is a fairly low grade alloy of silver. It usually will not be as white in color as sterling or pure silver. British markings for silver are called hallmarks. They are very tiny pictures stamped on silver items like cups, bowls, plates, etc. The British mark for silver is a left-facing lion with one paw raised. Nickel Silver, German Silver, Brazil Silver, Montana Silver, and other _______ Silver markings refer to an alloy of nickel and copper to create a silvery colored metal. These items are very common and you must be careful when purchasing these because the word silver in the marking is only referring to color and not the element silver. A4 means the item was plated for times. We have seen a mark as high as A12 meaning it was plated 12 times. Plate means it is plated. Platinum is a very rare metal and is very expensive to make into jewelry because of it's high melting point. There are typically only two different grades of platinum that are made into jewelry but there are still quite a few stamps for them. Keep in mind, when cobalt is used in the alloy, it will likely be magnetic. Pt 900 or Plat 900 or Plat or 90/10 Pt/Ir or 900 Pt 100 Ir or Platinum, these markings refer to the most common alloy of platinum which is 90% pure. The other 10% is most commonly iridium which is added to increase the hardness and thus durability of the platinum. Sometimes the alloying metal is ruthenium or even cobalt because they provide an even more durable alloy. Pt 950 or Plat 950 or 95/05 Pt or 950 Pt 05 Ir, these markings refer to a slightly more pure alloy. The other metal in this alloy is most commonly iridium but also ruthenium and cobalt as well. We hope this has helped you decipher some of the stamps you have been wondering about. If you have any questions or comments please feel free to let us know!